This individual is not a direct affiliate of the Berkley Center. S/he works with one or more of our core projects or programs. Please find specific details in the tabs below. Aref Ali Nayed is founder and director of Kalam Research and Media. Since September 2011, Nayed has served as Libya's ambassador to the United Arab Emirates and helped found the Network of Free Ulema, a group of religious leaders that expressed opposition to the Gaddafi regime. Prior to Gaddafi's overthrow, Nayed lectured on Islamic theology, logic, and spirituality at the Uthman Pasha Madrasa in Tripoli and also taught at the Pontifical Institute for Arabic and Islamic Studies and the International Institute for Islamic Thought and Civilization. 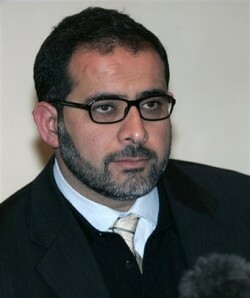 He is senior advisor to the Cambridge Inter-Faith Programme and fellow of the Royal Aal Al-Bayt Institute. His publications include The Author’s Intention (2004, with Jeff Mitscherling and Tanya Ditommaso) and Vatican Engagements: A Muslim Theologian’s Journey in Muslim-Catholic Dialogue (2015). Nayed was the chief spokesperson on behalf of the October 2007 open letter, A Common Word Between Us and You.